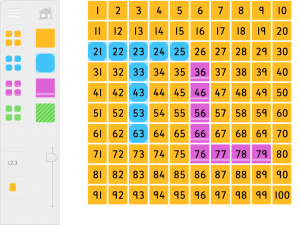 A new refinement on a variety of number squares produced for this site. This one has distilled its features down to the most commonly used ones. Each tile also has non-colour-based identification for use with children with colour vision limitations. Tiles can also be made to ‘jiggle’ to highlight them. One hundred numbers can be shown ranging from -99 to 940 and any highlighted will remain highlighted when took off screen and then brought back. This resource is part of a downloadable app for iOS devices. Go to hundred square teaching resource.